In the age of Facebook and Twitter and the ubiquitous selfie, when we all feel the need to make our lives look more exciting by plastering everything we do and see across social media, I have begun to notice a disturbing trend while traveling the world. A trend that leans toward the ignorant, the insensitive, and the downright disrespectful. We've all seen THAT tourist. The one throwing up a peace sign at a war memorial. The one grinning at a burial ground. The one taking “jumping” shots in a place where people suffered. The one snapping selfies at a concentration camp. Yeah, you've probably seen them, too. And maybe you felt a special type of rage towards them like I did. War memorials, disaster memorials, memorials to people who suffered… these are not the places for grinning or goofy selfies. 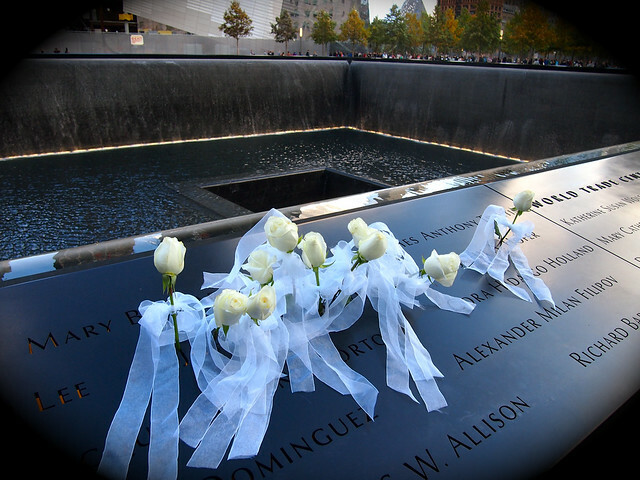 These are places where people — often people who knew or are related to the victims — go to pay their respects; to remember and honor those who died. You may not have the same connections to these people, but you should keep in mind that others around you do. Where I've seen it: I spent 5 days in Berlin last summer, and found myself at the Memorial to the Murdered Jews of Europe on more than one occasion. If you've never seen the memorial before, it's basically a city block covered in what look like stone boxes set at different heights. It's meant to be abstract — but it's NOT meant to be treated as a jungle gym. I saw so many people leaping across the pillars, posing on top of them, and even playing tag in between them. Don't do this, people. Visit the free Holocaust museum underneath this memorial, and you'll realize that this is not the place for goofing off. I feel like this should be a given. If you are visiting a place where people lost their lives in some sort of horrific fashion, it's not the place to snap a duck-faced selfie. Period. Show some respect. If you're not interested in learning about what happened at said place, at least pretend like you are. Or just don't go in the first place. Where I've seen it: I'll never forget going to the 9/11 Memorial for the first time in New York City. I went on a tour led by 2 people who were there that day — both of whom had been in one of the World Trade Center towers and managed to get out before they collapsed. Their stories moved me to tears. And then I turned around to see tourists posing with big smiles and peace signs in front of the memorial fountains — fountains that are covered with the names of the victims who died on that very spot. Noooot really the place. And then of course there's the girl who's proud of her Auschwitz selfie. I just… I can't even add commentary on that one. First of all, you should probably be respecting the local people in the places you're visiting. After all, YOU'RE the outsider here. But, if you're not going to respect them, at least don't take photos of yourself mocking them, their homes, or their way of life. Don't take a photo of (or with) someone that you wouldn't want someone to take of (or with) you. Where I've seen it: People taking selfies with homeless people (because apparently this is cool?). Or people taking selfies with monks when they're going about collecting their morning alms (this one is getting out of control in Southeast Asia). “Acting like a douchebag” can cover a lot. I realize this. But I'm sure you know what I mean — we don't need any more selfies of you drunk off your face in public, posing with something inappropriate, defacing something ancient, etc. If you insist on BEING a douchebag, fine. But there's no reason for you to put evidence of it up on Instagram. Where I've seen it: The worst was probably people snapping selfies while feeding bags of potato chips and cans of Coca Cola to monkeys in Thailand. First of all, please DO NOT FEED WILD ANIMALS in the first place — and especially don't feed them crappy human food. I wanted to slap each and every one of these people. And I'm sure you've all heard the stories of people taking photos of them doing illegal things on their travels (how stupid). Or how about all those dumbasses trying to snap selfies at the Tour de France and getting in the way of the riders? BAD TOURISTS, BAD. Lastly, if you find yourself in a situation where something bad is happening right at that very moment, for the love of God don't think about the best angle for your epic selfie. Put aside your vanity and either get the hell out of there, or figure out what you can do to help. “Citizen journalists” ARE a thing. But these people report the news — they don't snap MySpace-style selfies when people are getting hurt in the background. Where I've seen it: I thankfully haven't witnessed this in person — yet. But I'm sure it's only a matter of time. For more awful selfies, check out the Selfies at Serious Places Tumblr account. What a world we live in. Can you think of any other instances when it's NOT OK to snap a travel selfie? On a serious note good tips though, feeding the animals is a definite no no in my book. Especially crap like Coca Cola…. 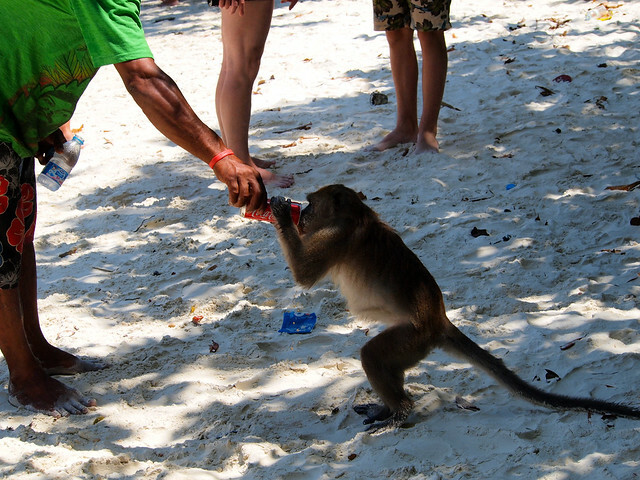 I could not BELIEVE that people were giving those monkeys cans of Coke! It was ridiculous! And the fact that they knew how to drink them… that made me really sad. When you come out of the toilet cubicle in a nice hotel wearing only your bikini…which is two sizes too small…then don’t bother to wash your hands because you’re too busy extracting your huge camera phone from your too small triangle bikini top to take a selfie posing in the mirror while taking up the space in front of all of the sinks when other people (me) want to wash their hands. Three minutes it took her. Just sayin’ 🙂 Loved this post. Inspired the hater in me…in a fun way. Obviously. All I can say to that is… EW. Glad I could inspire the hater in you in a fun way! We all need that sometimes. Good post. I find people’s behaviour ridiculous sometimes, especially that time you saw people playing tag in the memorial. WTF???? I have never seen something quite that bad. Yeah, I feel like it just gets worse the more popular smart phones and social media become. I really agree with all of your points, but when I went to the Memorial to the Murdered Jews of Europe, an old Jewish German woman pointed out that it is completely normal for kids and teenagers to be playing among the stones, and it was heartening to her that these children were enjoying the childhoods that so many children were denied during the Holocaust. She thought that the memorial was a good alternative to a park for young people to spend time, because they will grow up celebrating their lives but always aware of the atrocities that happened in their past–but having lived through those times, she felt like it was important to continue moving on with our lives, even if that meant treating the place like a jungle gym. I don’t know what she’d say about the selfie phenomenon, though. That’s a really interesting comment, Elizabeth! And it’s true that the memorial is totally up for interpretation – so I guess it’s good to know that the locals don’t mind people playing around on it. My main issue were the tourists there taking stupid photos who probably had NO idea what the memorial was there to remember. I know! I’m the same way. In fact, even though I’m a blogger and always have photography on my mind, there have been some places where I just couldn’t bring myself to snap ANY sort of photo. Taking a selfie? I would never dream of it. This reminds me of all the people I saw taking selfies with Thai soldiers after the recent coup. I just don’t get it. UGH. Yeah, that’s a great example of my last point. I don’t get it, either. Excellent post – it’s a shame that the worst offenders are probably not readers of great travel blogs. I don’t like the tiger photos in SE Asia. “Oh it wasn’t drugged,” my friends tell me when they come back from holiday in Thailand. Sure. The big wild animal just loves being cuddled by humans. Great sentiments. My friend took a nasty fall down some stone steps recently, just outside a trendy restaurant packed with people. Not a single person got up to help her, even though she was obviously hurt. But, several people laughed and snickered, and proceeded to take selfies with her in the background, sprawled on the floor with bleeding hands, head and knees. Thank goodness her daughter was with her to lend a hand and call for medical help. How horrible!!! What is wrong with people?!? I’m glad that I read this post. Never paid heed to such senseless selfies, so I will be more conscious while traveling. (Although i am fond of my own photos) I’m one of those who don’t care for selfies much anyway, so I don’t think I have ever done something of this sort on any of my travels. But, I think everyone should be sensitive towards such places where people have been buried or cremated. And, feeding animals is the worst thing to do! I don’t really love having photos of me taken, so I’m definitely not a huge selfie-taker as it is. But yes, it’s really important to be conscious of your surroundings if you ARE going to take them! It’s SO disrespectful. I mean, if it was the other way around, would you want someone snapping a photo of YOU at a low point in life to put up on the Internet? It’s different if you ask for permission, of course. But most people don’t. I personally don’t like selfies – period. Especially not in the above mentioned situations. Yeah, I’m not a huge fan either. I agree.. I saw that girl who was proud of her terrible selfie on the news.. then there was the girl who took a selfie holding hooted mascara from the crash site in Ukraine! I didn’t see the Ukraine one! God, people make me fear for humanity. Ugh, all of this is so true. When I was in Cuba we went on a boat excursion to a tiny island called Cayo Iguana – it was home to loads of Iguanas. A horrid fat and hairy Argentinian man decided it would be a great idea to PICK ONE UP while his girlfriend took photos, and then he THREW it down onto the ground when we shouted at him! He then proceeded to chase a large iguana while his girlfriend laughed and took photos, the iguana was so scared it ran into another iguana’s hole and the other iguana attacked it. Poor thing must be traumatized! I was so angry I wanted to cry. Bad tourists piss me off, that’s for sure. Ugh, that would have made me really angry, too! Just wondering, why do you have a problem with people giving the peace sign at a site where people died? I don’t think it’s the peace sign that is the issue- it’s the whole selfie thing. Why do you want to take a photo of yourself at a site where people were tortured and died? It’s not the peace sign itself. It’s the people who’s go-to photo is of them wearing a big grin and throwing up a peace sign next to their face (I’m sure you can picture it). I don’t find these appropriate in most cases. I had to read this twice because… What the actual Eff?! Why are people doing this? I took photo’s of Auschwitz, sure, but only some parts- even that made me feel uncomfortable. Actually since visiting Auschwitz I am even more emotional than I was before at site’s like this. We visited the last remaining section of the iron curtain in Slovakia a couple of weeks ago, and the memorial described how the victims who died there were killed. And I was a mess, had to walk away from it. I can never wrap my head around how people can become so evil. So it’s not something I would want to be taking selfie’s of. I feel the same way, Sammi. I took photos at Auschwitz last year because I knew I would be writing about it on my blog. But there were some parts I couldn’t bring myself to take ANY photos of (like in the crematorium), let alone selfies. I really appreciate sites (such as the Deportation Memorial behind Notre Dame in Paris) with signs that say no photos! It makes you stop and think of why and how that place is so important. There are plenty of other places to take pix! Oh I wish more places like this would enact (and enforce) a no-photo rule! I agree with most of these items. I think someones people see something of significance and whip out their camera. We’re conditioned to always smile when there is a camera in their face. Whereas in many Asian cultures, it peace sign is their conditioned response to a camera. It’s almost automatic if you will and people don’t think too much about it. 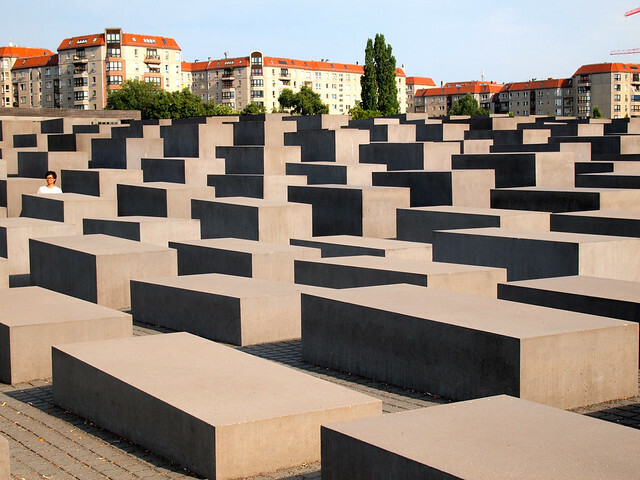 However, specifically with Memorial to the Murdered Jews of Europe in Berlin, I think the behaviour of kids running around and playing through it is encouraged. I saw a lot of families out in the memorial during my visit. My tour guide explained it as a way for the next generation to understand the past, but also look to the future. I wouldn’t condone that type of behaviour elsewhere though. Yes, I totally agree that some things are just instinct when someone puts a camera in your face (like smiling or throwing up a peace sign). I just think people should think twice before they even pull the camera or iPhone out in these situations. Someone else made a similar comment about the memorial in Berlin. If the locals encourage playing around in/on it, that’s one thing. But I dunno, I was still bothered by it! I couldn’t agree more. It seems as if the numbers of inappropriate selfies are increasing which is just sad. There are so many places where you just shouldn’t be playing around or taking grinning pictures near. And I don’t think it’s a lack of education it seems like a sheer lack of respect. Some young woman was taking grinning selfies at a concentration camp and she KNEW what it was. You just want to hit her over the head and yell “don’t you realize that people DIED horribly here?!”. I don’t get it. I don’t get it either, and I hate that it’s a trend that just seems like it will continue and get worse! In Goa I saw a russian couple take a photo as they handed over a 20 rupee note (about 40 cents) to a poor man with no legs and one arm at the markets. Disgusting. Disrespecting the locals is huge. I actually didn’t know, but taking pictures in a Shinto Shrine in Japan while someone is praying is completely rude UNLESS you have strict permission. Japanese people are usually too polite to complain, and it truly is an amazing picture opportunity, but you really need to ask. In Cambodia (where I am now), I saw a traditional Khmer dance show. When the performers came out to bow, almost immediately, people started rushing the stage to take pictures with the obviously uncomfortable performers. I get that it is a nice picture, but you have to have some self awareness to see that they are obviously not smiling and being used as props. South East Asian culture has a tendency to appease the tourist by any means necessary. While it actually bothers me, my Thai friends don’t see a problem with this, so I am kind of confused. They see it as just being easy going. SO much of it just comes down to many tourists having no sense of awareness. They ignore the uncomfortable signs given off by the people they’re photographing because they’re too concerned about getting “the shot” to step back and consider that what they’re doing might be in bad taste. Oh dear! There are some shockers in there! Yes. And the sad thing is I have seen most of these happen on my travels! I feel like an old fuddy duddy using the line, “kids these days,” but yeah kids these days… Taking selfies has become such a norm for so many people, that some might not stop and take a second to think about whether or not a selfie is appropriate for where they are/who they are with, etc. I don’t have a smartphone, and I hate taking photos of myself, so I’m pretty much the opposite of a selfie person. Actually I felt weird just taking photos of the concentration camp at Dachau when I was there a few years ago, even when I was being respectful. Haha, I feel the same about “kids these days,” Alouise. And I’m with you – I’m pretty anti-selfie in most cases. Like all things in social media selfie’s are a passing trend. Next year something else more shocking will take its place. I thing a little of thought is required before taking a selfie. Majority just do it on impulse. I really HOPE that they are a passing trend! Selfies with homeless people? This reminds me of a news story I heard a few years ago where people were randomly attacking homeless people — beating them up, and taking videos and putting it online. Crazy stuff! I really don’t get people sometimes – how could you possibly think that’s okay?? Ugh some people can be so annoying. I went to the Oklahoma Memorial with some of my friends and I was really disappointed with them. They were giggling while we were walking up and I was mortified. I walked faster to separate myself from them as I didn’t want others to think I was part of the group. Once inside they stopped thankfully. In that case, I know that some people just don’t know how to handle really somber places like that and jut dissolve into nervous giggles. I would have been embarrassed, too. At least they weren’t snapping selfies, though!! Well said lady! Luang Prabang, Laos. The morning alms collection. I actually cried to see what goes on these days, it was horrible. Some of the monks are just 8 years old, horrible. I’ve heard that it’s pretty bad there. I went to watch some monks going on their morning alms rounds in Chiang Mai, but it’s not nearly as much of a spectacle there. I did take some photos, but only after getting the attention of the monks to let them know I was going to snap some shots (from afar). And I certainly didn’t try to take any selfies! YESSSSS! I had the same thoughts when I was at the Holocaust Memorial in Berlin and then wrote an entire post about people’s horrible behavior at Auschwitz. I wish people had a little more respect when they travel to these kinds of places. Me too. I’m not sure what to blame the lack of respect on… but it’s definitely a problem. Woah. This reminds me of something I read (on Buzzfeed probably) about teenagers taking funeral selfies. “At grandpa’s funeral. Here’s my sad face!” wtf!?!? Yeah, WTF is up with funeral selfies?? I have to disagree on the douchebag selfies. Anything that helps get some of these people arrested and away from the harm they are doing is good. Really great article by the way. I went to Thailand in February and remarked on the monkeys (here, if you want to look what I said). It’s so bad, and so disrespectful, especially when you then leave the litter all over the beach. Just no!! Also, Auschwitz / concentration camp selfies. NO! Yeah, Monkey Island was terrible – I wish I would have never went there! It’s probably not a good idea to take selfies standing on the edge of a cliff…..it can, to coin a phrase, be a dangerous biz. I was in Berlin recently too, and it was so annoying to see people taking silly photos at all the memorial stuff. So inappropriate! I get that it’s easy to snap pictures of everything with your phone, but some people really cross the line and don’t think about the context they’re taking their selfies in. It’s good that you did this travel selfie posts because some travellers are just taking photos without minding the locals and the affected person’s feelings. I feel that they are insensitive taking this kind of photos. Yes, they definitely can be insensitive sometimes! Great article. Being responsible with taking photos is extremely important. I once saw somebody take a selfie in a Holocaust museum. Yeah, that’s definitely not cool! Why would you want a selfie there? I don’t get it. I totally agree with you. I kinda feel sorry for those monkeys who were given Coca Cola to drink. That’s bad. It’s very bad! I feel sorry for those monkeys, too. Yikes! Luckily I have never come across any of these instances (someone probably would have gotten yelled at), but these scenarios that you have encountered are SO ridiculous! I mean really, who runs through a grave site? crazies. I swear, some people just don’t have brains in their heads. I found it! This post sums up how I felt perfectly. It makes you want to poke those people in the eye. Human suffering, or animal suffering, is not something one takes a selfie with. You are most definitely NOT alone in your rage, as all the comments on this post prove! I hate to generalise but I noticed “bad tourist” most in Southeast Asia. Feeding monkeys coke and chips among just being general douchebags in a variety of ways. Ugh some people should just be banished! Yeah, unfortunately you see a lot of these along the “backpacker trail” – and it’s going strong in Southeast Asia. I too saw people taking selfies and climbing on the memorial in Berlin. Are people really that stupid? I guess the answer is yes! I completely agree with this article! Today is 9/11 and a girl I know posted a photo on instagram of her boyfriend at the memorial fountains with his sunglasses down his nose looking over them. Obviously trying to do a “cool” pose. Her caption was something along the lines of “missing my man while never forgetting.” like come on. Don’t take selfies at a place like that. Especially a ridiculous posed picture like that. Where’s the respect? And she obviously was just posting it to go along with everyone else, I don’t think it was truly to respect what happened there 14 years ago. Great post! Hubs and I were at the S-21 PRISON in Phnom Pehn (2017) and LOTS of Chinese tourists were taking selfies. HELLO!! People freekin’ died there, hello!! Yeah, some people have no awareness at all! It’s something that I find very tasteless and it definitely bothers me when I see it! I even feel awkward taking regular photos in some of these places, even though I’m taking them to use in blog posts. It just feels wrong.